This entry was posted in Uncategorized and tagged aliens, science, UFOs. Bookmark the permalink. 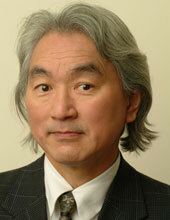 So it could be said that Dr. Michio Kaku is Schrödinger’s Cat? I thought of Schrodinger, too, but Kaku never attributed the theory to him. He stated that a single electron has been observed existing in two different states simultaneously. I have no idea how you observe such a thing, but I’m not sure if that’s the same thing as Schrodinger’s cat.